Exclusive designs and the maverick innovations of our team of experts have helped us put forth a wide array of wooden pallets. 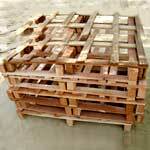 Made from high quality wood, these wooden shipping pallets can be used to accomplish your desirable decors. Available in a wide range of designs. These wooden pallets are sure to turn the heads on owing to their fine finish and splendid designing, thus making us a famous wood pallets manufacturer. 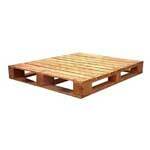 Our pallets are economical as compared to plastic and metal pallets. They are recyclable and made from renewable resources. We are also among the top suppliers in this business. Description : We manufacture customized as well as standard pallet ( EURO PALLET of size 800*1200, 1000*12000, 1200*1200 mm ) with loading capacity of up to 1.5 MT. In neem, kikar ( babool wood ), and pine wood suitable for warehousing purpose, exporters and domestic market.